Famous people born on JULY 17, typically dislike conflict, confrontations and arguments. In short, they like to keep their life free of messy or negative situations. There can be no resolution in screaming and fighting, so they simply walk away until things calm down. As smart as they are, it only seems natural that they will be able to accomplish any goal they set out to complete. As a parent, they will probably have an open door policy. They will likely be a person who wants to live a comfortable lifestyle and will work to achieve this status. But they can be a little stubborn themselves. So don’t push this Cancer personality over the edge. Otherwise, they can take a joke and they like to joke around and have a good time. Diahann Carroll, funny lady Phyllis Diller and Donald Sutherland are famous celebrities born on this day July 17. So it’s safe to say that you all share some of the same qualities. July 17th famous Cancer people are extremely business-minded with much to say in favor of their achievements and goals. They would like to share their wealth and riches with someone very special. Having celebrated your birthday today got triple 7 in number. I’m 56 today. 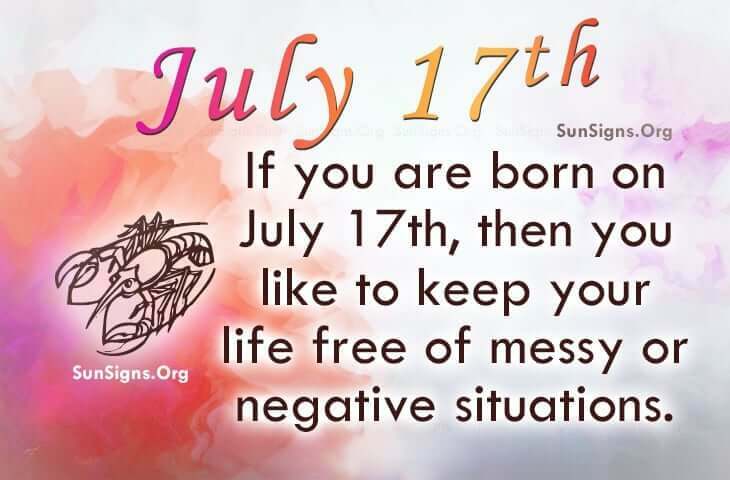 I’d like to have friends of the same birthday as mine July 17,1961 with the interests to know if we really have the same thinking about things and life.